Chad was raised in Boyden and graduated from Boyden-Hull High School in 1995. 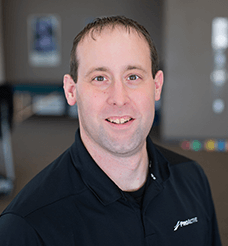 Chad attended Northwestern College and graduated with a degree in exercise science before attending and graduating from St. Ambrose University with a Masters degree in Physical Therapy. Chad has worked as a physical therapist in Sheldon since 2002, the last 7 years at ProActive Physical Therapy and Sports Rehab. His wife Lora works for Love INC National as Director of Affiliates and they have 3 sons and one daughter. Chad enjoys coaching his kids in youth sports and attending their activities. I enjoy the variability of each day of work and setting an individualized plan of care for each patient and their limitations. I also enjoy the personal connection with patients and helping them meet their goals and guiding them along their journey to recovery. I hope that each patient that we treat knows that we care about their needs and have designed their treatment to meet those specific needs and goals. Outside of work, I enjoy sports with my kids especially basketball and likes to read Tom Clancy books.